Most school-districts are already forecasting multimillion dollar shortfalls for years to come. Will lawmakers roll back parts of their court-ordered plan to increase state spending on education? The Legislature, however, has already moved onto other costly priorities. Last year, the state Supreme Court granted its blessing to the conclusion of the decadelong school-finance case known as McCleary. The case officially closed in June, after legislators agreed to pour an additional $776 million — for teacher and other school staff salaries — into local district coffers. “It’s done,” declared one of the plaintiffs whose family was the namesake of the lawsuit. 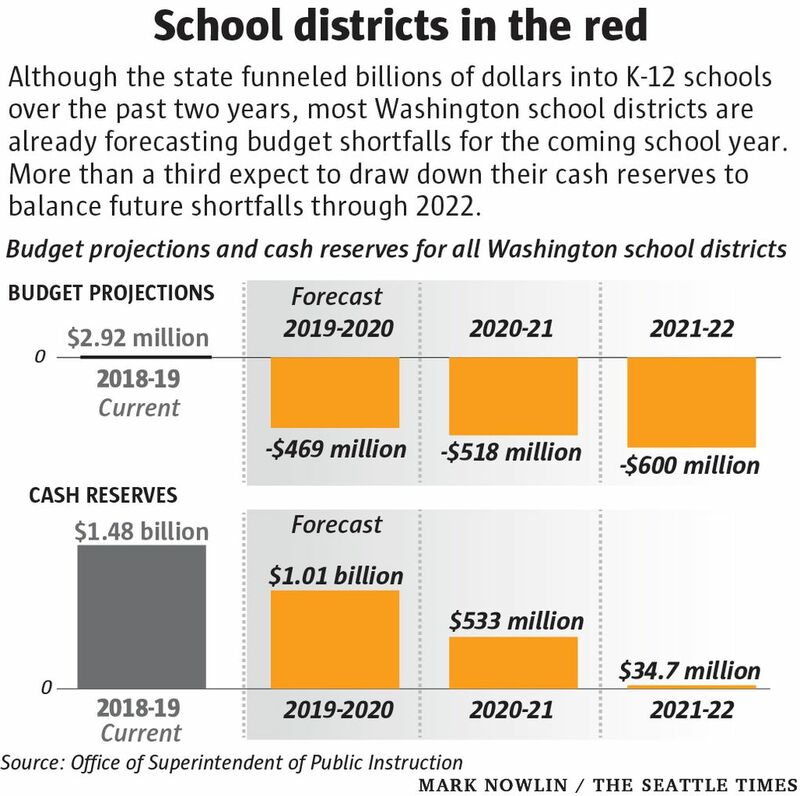 Still, 191 of the state’s 295 school districts are already in the red, according to a Seattle Times analysis of districts’ own financial projections. As of late 2018, 253 of the 295 districts expect to face a budget shortfall this upcoming school year, according to their four-year spending plans. More than a third of all districts anticipate drawing down their entire cash reserves through 2022. And though school districts are required by law to have balanced budgets, some even project their reserves will fall into negative territory. Dire forecasting is a common way organizations preview a funding gap, said John Hicks, executive director of the National Association of State Budget Officers. Part of the forecast is messaging — showing the Legislature why districts need more money. “Without legislative action, valued K-12 programs and staff positions will be cut, class sizes will go up and some districts may be insolvent,” Webb said. What’s to blame? Some school leaders cite the state’s continued underfunding of special education. Others complain about the unintended consequences of school-finance reforms passed in 2017. The most vocal districts, meanwhile, blame the Legislature’s decision to offset a hike in the statewide property tax to pay for the McCleary fix with a new set of caps on local tax collections that districts rely on to pay for salaries and programs not covered by the state budget. Education policy advocates, meanwhile, have struggled to follow the money. 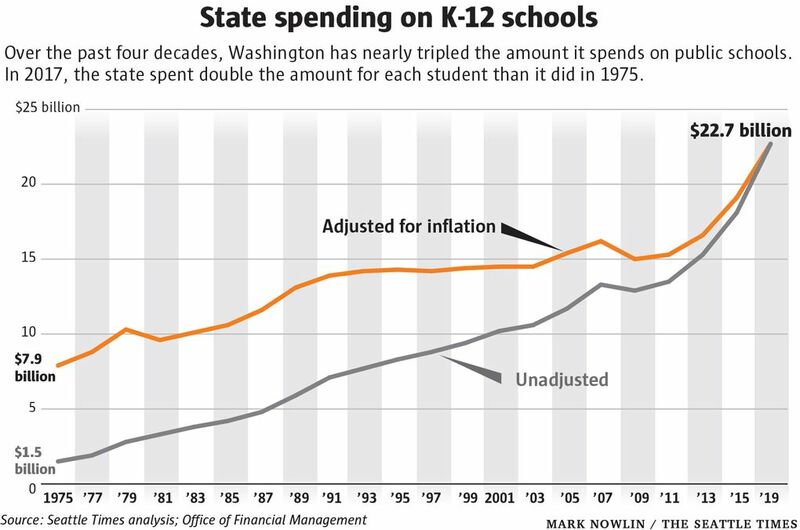 In Olympia, lawmakers don’t completely buy the warnings of financial doom and gloom that districts are selling. Legislative leaders from both sides of the aisle noted that many districts — before they claimed illiquidity this year — bargained double-digit pay hikes for their teachers last summer. “That’s part of the problem, no question.” said House Majority Leader Pat Sullivan, D-Covington. He also acknowledged that, after school finance claimed much of the political spotlight since 2012, there’s a palpable sense of “McCleary fatigue” in Olympia. Still, about a month into the legislative session, legislators have filed more than 160 individual bills related to education, the Equity in Education Coalition found. That gives Sharonne Navas, the group’s co-founder and executive director, some hope. “There is political appetite to ‘get it over with,’ knowing that the solution they came up with in June was nowhere near as good as it could have been,” Navas said. The instability has put some educators on edge. “It’s like déjà vu,” said Anne Aliverti, a teacher-librarian at Bryant Elementary in Northeast Seattle. Two years ago, she was told her job would be cut in half, but Seattle Public Schools reversed course and reinstated her position. Now, the district has warned that librarians could again be employed only part time. Aliverti won’t learn the fate of her job until next week, when Seattle principals receive their budget projections. But even those numbers aren’t final, as lawmakers won’t begin debating the details of their own 2019-21 budget until the House unveils its proposal in late March. Her counterparts elsewhere face similar uncertainty. In Seattle, where School Board President Leslie Harris regularly calls the McCleary fix “fake news,” the district projects to spend $44 million more than its combined state, federal and local revenues during the next school year. The gap climbs to $68 million by 2021. Last summer, the district and the union representing 6,000 of its employees agreed to only a one-year contract, narrowly avoiding a strike but prompting another round of major negotiations in the coming months. 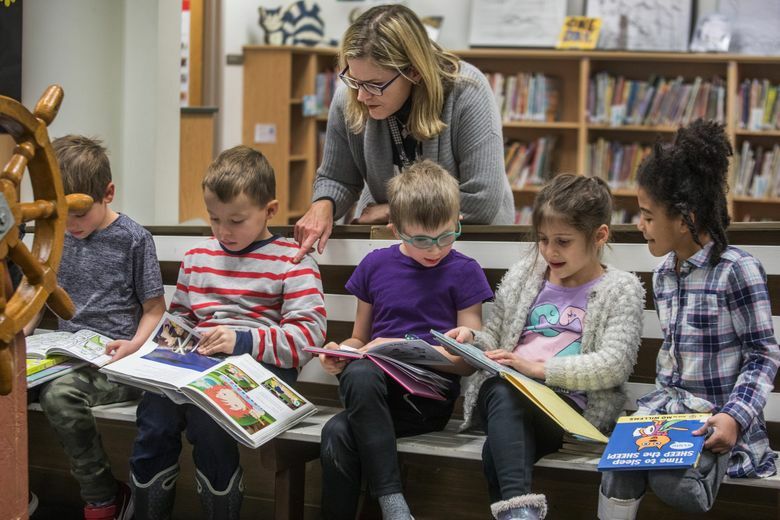 Those talks will happen, though, as the district plans up to $40 million in cuts for the 2019-20 school year. Union president Phyllis Campano said she doesn’t think the district is setting the bargaining table too early by announcing those imminent cuts. District leaders, meanwhile, have a backup plan: This month, voters handily approved the district’s property-tax levy to fund day-to-day operations. That allows for a 2020 collection rate around double what the state law would permit, a strategy that banks on the hope that the Legislature permits higher local levy rates. Although lawmakers on both sides of the aisle agree they should do something to boost state funding for special education, there’s no guarantee they will offer districts much relief. The chief Republican budget writer, state Sen. John Braun, R-Centralia, suggested state leaders need to assert more control over how much local districts allow spending to grow. One proposal that has gained traction this legislative session would offer districts the choice of setting a local property tax that collects up to 20 percent of their combined state and federal funding or a rate that raises $3,500 per student. In Tacoma, where educators picketed for seven days after salary negotiations broke down last fall, levy flexibility would offer some breathing room. The district has been cutting positions since it agreed to double-digit pay hikes for teachers last September, but now has started asking the public to weigh in on a looming $30 million in cuts coming next school year. The Washington Association of School Administrators (WASA) recently included Tacoma on a list of 115 districts that it argues actually lost money or only saw a negligible increase under the McCleary budgets passed in 2017 and 2018. The organization estimated it would cost $123 million for those districts to break even. That’s chump change relative to the overall budget, said Dan Steele, WASA’s director of government relations. Legislative staff have, in fact, projected that all new revenue coming into the state over the next two years will be consumed by commitments from the past McCleary budgets. That may make it difficult for lawmakers to fund other long-delayed priorities, such as mental health and homelessness. They also need to pay $900 million toward a state takeover of school employee health-care plans. “I am very much aware that we need to fully fund that obligation,” said Rep. Lillian Ortiz-Self, D-Mukilteo. A counselor in Everett Public Schools and member of the House education committee, Ortiz-Self said she has heard overwhelming concern from districts about having to tap their already-stretched levies to pay for new health-care costs. The state’s second-largest district, Spokane Public Schools, has cited those obligations as part of its funding woes. So has Brian Talbott, superintendent of the neighboring Nine Mile Falls School District. Without any changes, Talbott estimated his small, rural district will likely have to cut $1 million from its total $18 million budget.